Quarles & Brady opened its Washington, D.C. office in 2012, having long intended to establish a presence in the U.S. capital. We are continuing to grow the office in multiple legal disciplines, seeking lateral attorneys who complement our established areas of service strength in order to grow strategically and expand our reputation for excellence in several key areas. Washington, D.C. was chartered by the U.S. Constitution in Article I, Section 8, and established by the 1790 Residence Act. The city grew from the original settlements of Georgetown and Alexandria, established in Maryland and Virginia, respectively. Although Alexandria was ceded back to Virginia in 1846, it remains part of the D.C. Metro Area, which is popularly defined as the areas of Virginia and Maryland that are encompassed by the I-95/495 Beltway. Today, the city is the center of the majority of the American federal government, and Quarles & Brady’s office lies right in the heart of it — the White House is only a few blocks from our Washington, D.C. location. The population of Washington, D.C. is one of the most diverse in the nation. African Americans make up 50 percent of the population, and Hispanic-Americans contribute another 10 percent to the total. Washington boasts exciting sports teams that provide the city with regular access to professional events. The Washington Nationals brought baseball back to D.C. in 2005. For those who prefer contact sports, the NFL offers the Redskins, and NHL fans can see the Capitals playing at the Verizon Center or practicing in nearby Arlington. Basketball fans can choose between the NBA Wizards and WNBA Mystics, soccer enthusiasts can cheer for D.C. United, and tennis and rugby fans can get tickets for the Kastles and Slayers. NCAA powerhouse teams like the Georgetown Hoyas are also right in town or a short drive away. For those who prefer to do instead of watch, the National Mall is always busy with office and intramural softball and soccer teams. The Tidal Basin is a popular site for jogging, crew, and Dragon Boats. The Marine Corps Marathon and the more recently established Rock & Roll Marathon push runners to their limits, while the Navy Five Miler and other short runs can be found in the area during most weekends. The District boasts three golf courses within city limits, but many more can be found in neighboring Maryland and Virginia. 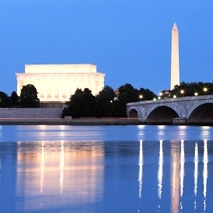 The Kennedy Center offers the best of the nation’s live music and performance — it hosts the National Symphony Orchestra, the Washington National Opera, and the Washington Ballet. The Verizon Center, 9:30 Club, Constitution Hall, and the Black Cat host both popular and lesser-known bands and artists in the city, while those willing to venture outside the District can catch performances at Wolftrap in Virginia or the Merriweather Post Pavilion in Maryland. The National Theatre presents plays, musicals, children’s programming, a classic movie series, and community vaudeville. And the infamous Ford’s Theatre, where Abraham Lincoln was shot, still operates as a theater, as well as housing a basement museum and bookshop dedicated to Lincoln. The Smithsonian complex on the National Mall includes the National History Museum, Air and Space Museum, American History Museum, and the National Galleries. The National Zoo, with its famous pandas, is in the Adams Morgan neighborhood, and the National Portrait Gallery is near Chinatown, right across from the Verizon Center. Private museums such as the Corcoran Gallery, National Holocaust Museum, National Geographic Museum, Newseum, and International Spy Museum round out the city’s offerings with a focus on today’s interests. D.C. is home to some of the oldest and best-respected universities in the country. Georgetown University, George Washington University, Howard University, American University, and Catholic University are just a few of the schools in the immediate area. The University of Virginia, William and Mary, George Mason, the University of Maryland, and the U.S. Naval Academy are all just a short drive away. From street vendors to the highest-end steakhouses, D.C. has options for even the pickiest eater. Grab a snack from a street vendor, or venture into gourmet eateries. Less than a block from the office, a steady rotation of food trucks feed the lunch crowd at Farragut Square. Pick up a half-smoke at Ben’s Chili Bowl, on U Street or at Nationals Park. Eat oysters and watch for political luminaries at the Old Ebbit Grill, Washington’s oldest bar and restaurant, just blocks from the White House. Try one of the new restaurants at Gallery Place for burgers, tapas, or happy hour. Celebrity chefs in residence include Jose Andres, Geoff Tracy (“Chef Geoff”), and Spike Mendelsohn. Washington, D.C. is a big city packed into a small town, offering limitless opportunities.